A recent Time article begins with a clever snapshot of Rip Van Winkle awaking from his 100 year nap to find himself immersed in unfamiliar technology, only to seek refuge in the one institution that has not appeared to change at all - a school. The article was prompted by the New Commission on the Skills of the American Workforce's December 14th publication of its powerful recommendations for sweeping change in American education. Although there is apparent controversy with some of the bold proposals, the consensus of these educators and business folk is that "we need to bring what we teach and how we teach into the 21st century." Time Magazine specifically highlights these four "21st century skills." 1. Knowing more about the world - As global citizens, students have an obligation to become aware of and sensitive to other geographies, cultures, and languages. 2. Thinking outside the box - Future job opportunities will focus on creativity and innovation, not rote or repetitive tasks. Time cites NCLB as one of the reasons schools have actually steered away from this goal in recent years. The need for more interdisciplinary curriculums is also stressed. 3. Becoming smarter about new sources of information - There is no question students can access more information that ever before. Educators must now facilitate skills in managing, validating, and interpreting that information. 4. Developing good people skills - Today, a person's EQ ("Emotional Intelligence") is even more important than their IQ. Traditional schooling can be competitive and individualistic, which does not bode well for tomorrow's collaborative workforce. These goals are important and attainable. For example, we pioneered and do continue to focus on civil behavior, with our building specifically concentrating on the five domains of Emotional Intelligence. 1. Self-Awareness, 2. Self-Regulation, 3. Motivation. 4. Empathy, 5. Social Skills. Our students know the vocabulary. They are used to referring to the domains when complementing other students or when discussing disciplinary infractions. A poster listing the five domains hangs in every classroom. The need for updated literacy skills are as critical as social-emotional skills. NCREL's EnGauge website discusses the importance of this digital-age literacy as part of a necessary set of 21st century skills. Systemic change takes time, but there are steps parents and educators can take. The Time article discusses curriki.org, a curriculum clearinghouse based on the wiki concept. 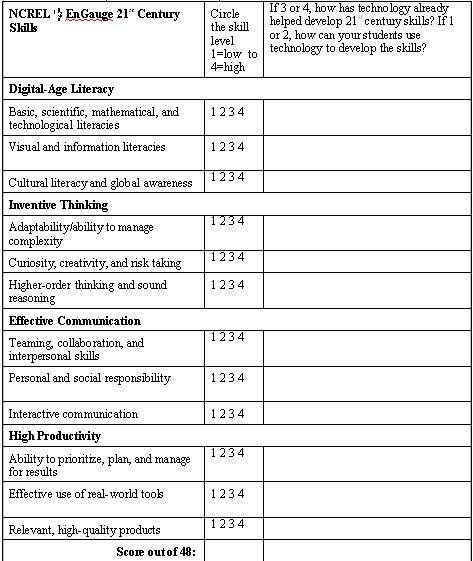 NCREL has created a variety of frameworks (such as the the one below) that an educator can use to become more mindful of the integration of 21st century skills into current lesson plans and activities. Educating these "21st century students" remains a daunting task in my mind. It is easy to get bogged down with the daily grind of the current public school system, however, I have to vow to not give up trying to address these goals of global awareness, innovative thinking, increased digital literacy, and social-emotional competencies. These skills are vitally important for our students. 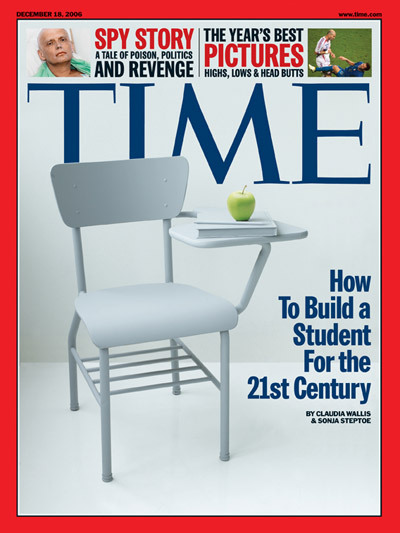 Schools featured in the Time article include Seattle's John Stanford International School, Michigan's Henry Ford Academy, New York's Baccalaureate School for Global Education, and Michigan's Farmington High. A great post at Learning.now highlights the irony of the Dec. 25th Time issue directly following this Dec. 18th article. I find it fascinating how the article suggests that eventually projects like Curriki might “take the Web 2.0 revolution to school,” as if there aren’t countless educators working their butts off to demonstrate to their peers how blogs, podcasts, wikis and other tools can be used to improve student learning. It’s as if the amazing, transformative universe documented in the Person of the Year issue hasn’t even come knocking at education’s door yet. Or perhaps the industrial-era schoolhouse walls of are simply too thick for us to hear it knocking. Maybe it’s because too many educators and students who embrace Web 2.0 are finding themselves in conflict with a system that worries what might happen if students are given too many opportunities to express themselves online, whether at school or at home. It was getting close to the holidays, and my students' attention for math was beginning to wane. So I developed an activity so that they could exercise their imaginations, while practicing their math skills. You might know the song… “On the first day of Christmas, my true love gave to me… a partridge in a pear tree” etc. If you really bought all 78 items sung on the last day of the “Twelve Days of Christmas,” it would cost you $18,920 this year, according to USA Today. If you were to choose 12 days of gifts for your own true love, what would they be? More importantly, how much is it going to cost you? It is kind of interesting to see what my middle school kids would buy in this lesson on percentages! (I got a lot of spinning rims (did you know they made them for bikes?! ), iPods and grills.) Feel free to borrow, copy, or modify the activity. I think many teachers are compelled to give their students the impression that they know everything. Maybe I'm just lucky to be teaching in a discipline of theories, where ideas are expected to be introduced, challenged, rejected, and modified over time. I have resigned myself to realize that even the most rigorous college science training does not prepare one for the questions 7th graders ask. "What state of matter is fire?" (hot gas). "Are there siamese-twin animals?" (there are). "How do bears pee when they're hibernating?" (they don't. they recycle the nitrogen into protein). "What would happen if you dropped antimatter in the earth's mantle?" (I don't know). You'll notice none of them ask me what the Na/K ratio is in the sodium-potassium pump. Or what is the adductor to conteract the deltoid muscle. They don't ask me how many electrons are in the outermost orbital of a noble gas. Nope, my college education does not help me when kids start asking questions. But, what does help me is a pad of post-its, an insatiable desire to learn, and access to the internet. At the end of the day, when my computer screen is littered with question-riddled post-its, a few students and I will look for the answers, and those we can't find, we submit to the experts. My favorite site is the UCSB Scienceline, where actual scientists email responses to student questions, although Wonderquest and The Why Files have helped us out, too. And I can't leave How Stuff Works off the list of most helpful sites. These are some pretty smart guys, and they seem to be sharing a similar message. Ignorance itself is not to be feared. It is an tool to define the parameters of your current knowedge and to identify areas in which to expand your knowledge. I firmly believe in admitting when I don't know something. In fact, I think it is very powerful to say to a student, "I don't know," followed by, "but we can certainly find out!" Should Wikipedia be used in school? A funny thing happens when you mention Wikipedia in schools. Some teachers stare at you blankly while trying to place the origin of that strange word you just used. Other teachers start shifting from foot to foot, until they explode in a tirade professing that any responsible teacher would keep their students far away from that unreliable source. Still others nonchalantly shift away from the conversation, not wanting to admit that they didn't realize Wikipedia wasn't just an ordinary encyclopedia after all. Of course, this is an exaggeration. But not by much. I conducted an informal survey at my own school. Of the paltry 24 responses I received from my little query: 4 (17%) teachers sheepishly asked what Wikipedia was (introduction), 13 (54%) said Wikipedia should not be acceptable as a credible source, 3 (13%) said they would allow students to cite Wikipedia, and another 4 (17%) said they would allow it as a source, but not as a sole source. Perhaps one of the most colorful responses I received comes, not surprisingly, from an art teacher. The Wikipedia debate is not new. In a July 2005 blog, Andy Carver acknowledges educators' "hostility" towards the resource, although he describes how "Wikipedia's flaws actually make it an ideal learning tool for students." In fact, Wikipedia surely embraces Carver's ideas, as these same ideas are quoted in Wikipedia's Schools' FAQ. Wikipedia never claimed to be valid. The disclaimer on the bottom of every page makes this quite clear. Sure, anyone can edit a wiki, and write that the moon truly is made of cheese. Although, in a heavily disputed study, Nature "suggests that such high-profile examples are the exception rather than the rule" as it found natural science entries in Wikipedia to rival those in Encyclopedia Britannica. Whatever your stance, we all must agree that the wiki is not going away. So, as with many emerging technologies, we must find ways to use it as an educational opportunity. There is no guarantee of quality for any given Wikipedia article. But more importantly, Wikipedia remains incredibly useful as an initial resource that provides a contextual framework for more exhaustive research. Perhaps those four teachers had the right idea. Wikipedia is a valuable source, but should not be relied upon as an only source. Students and teachers should debate Wikipedia and even contribute to it; remember, it's a work-in-progress, not a finished body of work. But all too often, the debate over Wikipedia's merits is left among the educators only, with students left out of the conversation and operating on a simple directive: don't use it. 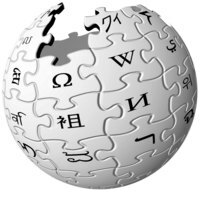 By ignoring Wikipedia rather than teaching critical, responsible uses of it, schools are practically inviting students to edit Wikipedia at their own peril. We should be preparing students for constructive participation in the Read/Write Web; otherwise it might as well be the Read/Vandalize Web. Andy Carvin did his own survey of educators and found little consensus among educators when it came to Wikipedia. Opinions abound on Wikipedia's usefulness in schools. I personally agree that Wikipedia is a useful springboard to further research, and an opportunity to really teach media literacy and fact validation techniques. In the world that awaits our student's tomorrows, I cannot think of two more valuable lessons for our kids.